Two book recommendations | Damian Trasler's Secret Blog - Do Not Read! Since I stopped keeping count of my monthly book reading, I’ve occasionally found myself composing short reviews of books I’m reading, only to remember that I’m not doing that anymore. Then I realised I COULD still do that if I wanted to. The world is my oyster. The internet is my hamster ball. The Pompidou Centre was a ghastly mistake that had nothing to do with me. Journalism is often writing about something that other people are doing. Josh Foer went a step further when he covered the National Memory Championships in America – he accepted the challenge to train for the following year and compete. 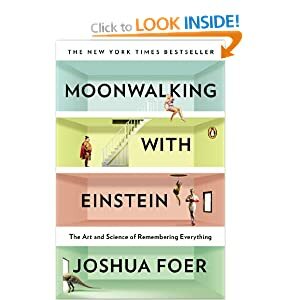 Along the way he investigates what memory is, how it works, whether it really can be improved, how it intersects with education, the historical memory versus the modern view, savantism… There’s really so much to this book it’s hard to nail it down. I got my copy through Audible, which is great because it prevents me skipping paragraphs (something I’m prone to with non-fiction), but it makes it harder to bookmark great passages for later investigation. There are some hints and tips in the book for improving your own memory, but mostly it is a fascinating ride through the history of memory and Josh’s personal journey from reporting on the National Memory Championships to competing in them. I picked the first of this series (Midnight Riot) from the paperback stand at my local library. It was great to find an Urban Fantasy book that wasn’t set in America and wasn’t fascinated by vampires or werewolves. Instead, these books follow Peter Grant, a young Detective Constable in the Metropolitan Police, as he stumbles across the arcane branch of the Met that deals with the Supernatural. Well, I say “branch”, but really it’s just Detective Inspector Nightingale. Nightingale takes Grant under his wing (ha! See what I did there?) and introduces him to the other side of London, while slowly coaching him in the art of magic. What’s refreshing about Grant is that he’s a modern guy who feels that doing magic is cool and fun, and he’s also a little bit scientific about the whole thing. When he discovers magic has a devastating effect on microchips, for example, he sets up a simple experiment to establish the range of the effect. He learns from mistakes, and he pushes at the boundaries placed on him by Nightingale. In short, he feels like a real person. “Whispers” is the third in the series, and again I got it through Audible. The performance is excellent and the story manages to stay logical while still scampering through magic and legend. I just picked up the fourth one this week. 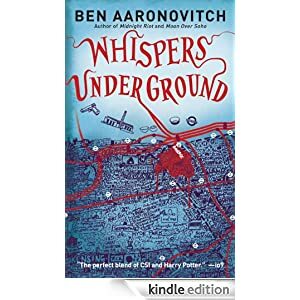 This entry was posted in Book reading and tagged Ben Aaronovitch, Books, Good Books, Joshua Foer, Reading, recommmended books, what did I read, what to read. Bookmark the permalink.